The fake news articles link Davide Tucci and the One Breakfast show to a Bitcoin scheme. Actor Davide Tucci intends to file a police report over several fake news stories linking him to a Bitcoin get-rich-quick scheme in social media adverts, posts and articles. 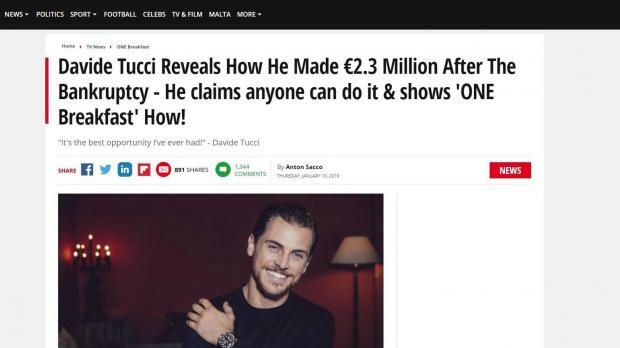 Sponsored posts have appeared on Facebook in recent days using the actor’s photos alongside headlines such as: “Davide Tucci Reveals How He Made €2.3 Million After The Bankruptcy”. The adverts link to a website made up to look like a legitimate news service, but clicking any of the links takes users to the same landing page for a Bitcoin trading platform - the same scheme promoted by similar stories falsely attributing the pitch to the Maltese government. Mr Tucci, who currently performs on TVM's L-Għarusa, said in a video posted to Facebook that he had never engaged in Bitcoin trading or given any authorisation for the published material. "This is clearly a scam and click-bait, please don’t buy into this," he said. "The allegations of bankruptcy particularly are very serious - and I intend to take this seriously by reporting the case to the Malta Police Force’s Cybercrime unit. "I have worked really hard throughout the years to get to where I am now and I won’t let my name and image to be used for any form of scam or dishonesty." Mr Tucci also urged views to screenshot and report the posts to Facebook if they saw them on their feeds. One Breakfast host Ms Degiorgio also said she would be reporting the matter to the police, writing on Facebook that the facts attributed to her were false and that the promoted service was a scam. The latest adverts show scammers varying their tactics after similar stories and adverts started to appear in recent weeks suggesting the Maltese government was behind the pitch. Headlines such as: "The government swears to boost the income of all citizens" and photos of Prime Minister Joseph Muscat accompanied the posts, linking to various fake news websites promoting the same Bitcoin scheme. The government said last week it had asked the police to investigate. "The government takes these articles, which have fraudulent intentions and portray Malta in a negative light, very seriously," it said in a statement.